David W. Dorries. AOG Heritage Magazine. Flower Pentecostal Heritage Center, Springfield, Missouri, USA. Part 1. ‘The Making of the Man’. Pgs 4-9, Fall Edition 1992. Part 2. ‘The Making of His Message’. Pgs 20-29, Winter Edition 1992/1993. 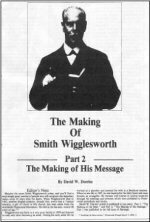 Two papers which explore how Smith Wigglesworth came to reach his position. Part 1 essentially addresses biographical details which helped to shape and develop him. Part 2 examines his theology and the influence of this upon his ministry. At the time the papers were written Dr David Dorries was an Assistant Professor of Church History at the Graduate School of Theology and Missions, Oral Roberts University, Tulsa, Oklahoma. Stanley M Burgess, Editor. 1278pp. Zondervan, Grand Rapids, Michigan, USA. 2002. This major work includes a biographical entry on Smith Wigglesworth along with other entries for many of his close associates including James Salter, Donald Gee, Stanley Frodsham and Alexander and Mary Boddy. Contributors include Desmond Cartwright and Wayne Warner. Pastor H. (Harry) V. Roberts, General Superintendent, The Pentecostal Church of New Zealand, Wellington. 51pp. Printed in New Zealand by the Pelorus Press Ltd., Auckland, New Zealand. 1951. An eyewitness account of the visit of Smith Wigglesworth to Wellington, New Zealand in 1922 which launched the Pentecostal Movement in New Zealand. Reports are included on the various meetings and the many signs and wonders which accompanied them. The author, Pastor Harry V. Roberts is the son of Henry Roberts, the host pastor for Smith Wigglesworth’s pioneering Pentecostal campaigns in New Zealand. Harry Roberts served in a leading role in the Pentecostal Church of New Zealand and later became Chairman of the Elim Churches in New Zealand. Lester Sumrall.. 200pp. Harrison House Inc., Tulsa, Oklahoma, USA. 1995. Lester Sumrall provides personal reminiscences of twenty-five men and women of God used to birth an outpouring of the Holy Spirit in the Church. There are chapters on Smith Wigglesworth, James Salter, Stanley Frodsham and Donald Gee, amongst many other well known names. Sumrall includes some graphic personal reminiscences of times spent with Wigglesworth at conferences and his Bradford home. Accounts of Smith’s ministry from pastors in the USA, Australia and New Zealand are also included. 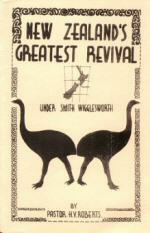 Lester Sumrall’s testimonies of time spent with Wigglesworth are also available on audio tape/CD and video. Ron McIntosh. 325pp. Harrison House Inc., Tulsa, Oklahoma, USA. 1997. 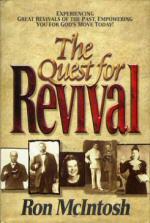 An in-depth exploration of past revivals and the lessons to be learned from the early revivalists and pioneers such as Smith Wigglesworth, Aimee Semple Macpherson, John G Lake, Kathryn Kuhlman and others. Ron McIntosh is a graduate and former chaplain of Oral Roberts University. Desmond Cartwright. 192pp. Sovereign World Ltd., Tonbridge, UK. 2000. Desmond Cartwright, an acknowledged authority on Smith Wigglesworth, is the official historian of the Elim Pentecostal Churches and founding archivist of the Donald Gee Centre for Pentecostal and Charismatic Research at Mattersey College, Doncaster, UK. This publication contains a wealth of fresh insights into the ministry of Smith Wigglesworth drawn from time spent by the author with members of the Wigglesworth family and from previously unpublished letters, documents, meeting reports and sermons. Also included are a number of early photographs and reproductions of historical documents. Winkie Pratney. 236pp. Huntington House Publishers, Lafayette, Louisiana, USA. 1994. A guide to revival, focusing on past revivals, prepared with the aim of stirring fresh interest in revival. It includes a chapter entitled 'Wonderful Miracles' which features a brief section on Smith Wigglesworth and highlights some of the evangelist's comments on spiritual growth. Also published as 'TOUCHED BY FIRE-PATRIARCHS OF PENTECOST-THEIR LIVES, THEIR VISIONS, THEIR MINISTRIES.' Logos International, New Jersey, USA. 1978. Wayne E. Warner (Editor). 164pp. Harrison House Inc., Tulsa, Oklahoma, USA. 1978. 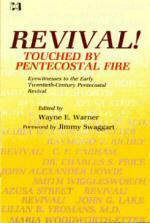 Forty eyewitness accounts of the early twentieth-century Pentecostal revival. First hand reports of the outpouring of God's Spirit in the meetings of Smith Wigglesworth, Maria Woodworth-Etter, John G. Lake, Charles Price and many others are included. The chapter relating to Smith Wigglesworth entitled 'The Healing of a Twentieth-Century Lazarus' is taken from Wigglesworth's sermon collection 'Ever Increasing Faith.' Wayne Warner is Director of the AOG Archive, Springfield, Missouri.